The NFL postseason is here at last and Intertops Sportsbook is ready and waiting with hot odds on the weekend’s Wild Card playoffs. While one game has an obvious favorite, three are looking very difficult to call. As Super Bowl excitement builds, the popular online sports book, which posts odds on all US major league sports (NFL, NHL and NBA), is offering a special Wild Card Deposit Bonus this week and a free draw for $1000. In perhaps the most interesting matchup of the weekend, the New York Jets travel to the Indianapolis Colts. The hosts have endured a below-par season in general, but four straight wins to end the Regular Season show that they are still a force to be reckoned with. Intertops bookmakers favor the Colts (-140) to knock out Mark Sanchez and co. (+120). Saturday also sees defending Super Bowl champion New Orleans go to Seattle as a 10.5 point favorite. The Seahawks became the first team in history to reach the postseason with a below .500 Regular Season record, but it now looks very much like the end of the road for them. Sunday’s showcase matchup sees Green Bay take on Philadelphia. It is a game that is likely to center on the duel between influential quarterbacks Aaron Rodgers and Michael Vick and Intertops bookies favor the home-team Eagles (-140) to move on. The Kansas City Chiefs have been one of the surprises of the current season and are hoping to keep their season alive at home to the tough Baltimore Ravens. Once again this is a difficult one to call, but superior playoff experience could well see the Ravens (-140) through in the end. 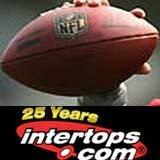 Intertops is making the Wild Card Weekend even more attractive for its customers by offering a deposit bonus through January 9th. In addition, every customer who wagers at least $50 on each of the four Wild Card games this weekend will be entered in a free draw for a $1000 bonus to be held on Monday. Wild Card Playoffs odds as well as Super Bowl odds and props are posted at www.Intertops.com/sportsbook.